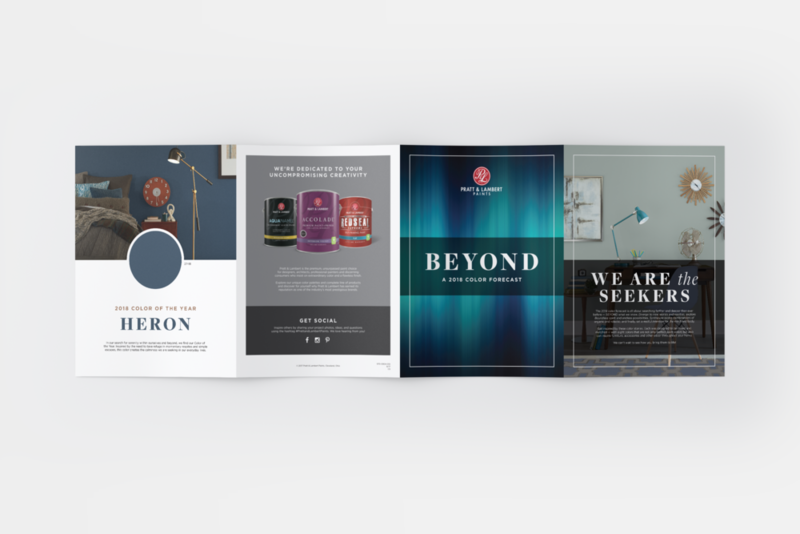 Sherwin-Williams reached out to GO2 to design a double gatefold brochure featuring the Pratt & Lambert 2018 Color Trends to use as an in-store piece that fully integrates with the Color Conversation initiative. This brochure leveraged the 2017 Color Trends brochure layout while also including Color Conversations branding and social sharing copy. In addition to being used in-store, this piece was used online as the Q4 Color Conversation. The 2018 color forecast was all about searching farther and deeper than ever before — BEYOND what we know. Diverge to new worlds and realities, explore Boundless spirit and endless possibilities, Synthesize exotic combinations of organic and robotic; and finally, set a restful Intention for the mind and body. Get inspired by these color stories. Each was designed to be mixed and matched — with eight colors that are not only perfect paint colors but also can inspire furniture, accessories and other décor throughout a home.